(May 2018) Dignity Health Foundation hosted its third annual Humankindness Gala on May 10 to showcase kindness and to address social issues facing communities served by Dignity Health, raising $1.4 million. Guests were greeted by Bay Area performers and walked an orange carpet sprawling across the entry to San Francisco City Hall, a play on the traditional red carpet. Atop the orange carpet were 8-foot tall letters reading “Hello” humankindness. Inside, City Hall was transformed to showcase the evening’s theme Through the Kaleidoscope: Kindness Reimagined. The gala recognized that kindness can be offered by all of us with the Everyday Hero award — acknowledging extraordinary acts that epitomize humankindness. 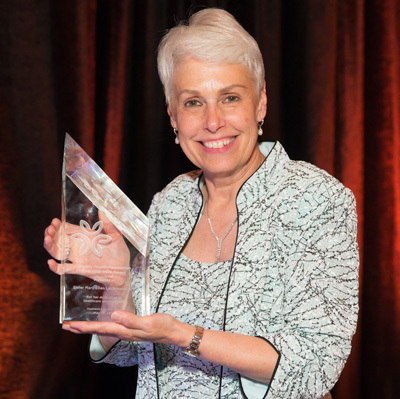 This year’s award winner is Sister Mary Ellen Leciejewski, an Adrian Dominican Sister and the vice president of corporate responsibility at Dignity Health. She was recognized for raising awareness of health care’s impact on the environment and for promoting programs that proactively address issues of sustainability. Dignity Health Foundation is a public, charitable foundation that was created to help solve major social issues and address health disparities facing our communities. In partnership with Dignity Health, California’s largest health care system, the foundation supports investments in people that help them live with dignity and hope. Ending human trafficking: Dignity Health is training its care teams to identify victims and connect them to resources that restore health, freedom, and hope for a better life. Confronting postpartum depression: Dignity Health is raising awareness, educating communities, and providing maternal health services to help these families in need. Championing concussion education: Dignity Health is empowering student athletes to recognize and respond to early signs of concussion. Improving health equity: Dignity Health supports health care programs that address social issues facing our vulnerable communities, including: mental health, chronic conditions, resources for our elderly, and trauma-informed care. At the heart of these initiatives is the goal to empower people to lead healthier and happier lives.